Trask was born and raised in Rapid City, South Dakota, and began working for Coca-Cola of the Black Hills in the summertime at the age of 13. Growing up in the culture of a family business, Trask learned from his father the importance of an ambitious work ethic, to have an eye for detail, and the practice of balancing work and play. 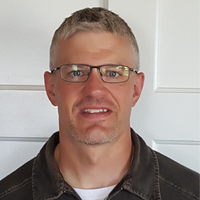 Trask graduated from South Dakota State University in the spring of 2000 with a Bachelor of Science degree in Business Economics. After graduation Trask joined his brother Trevor, and began his full time employment with the family company in June of 2000 as the third generation. Trask’s current work title is Chief Commercial Officer. Trask and his wife Stephanie enjoy every moment that they are blessed with to spend time together. Trask and Stephanie love the Lord and strive to keep Him at the center of their marriage. Trask and Stephanie spent 6 years as Young Life Leaders where they got to share their love of the Lord and the power of the Gospel with High School kids. Bible study, fly fishing, camping, backpacking, spending time with their 9 nieces and nephews, and just being in God’s creation top out their list of favorites.